A new study by Transparency Market Research (TMR) states that the degree of competition between BASF SE, Air Liquide SA, Sasol Ltd., and The Linde Group defines the competitive landscape of the global syngas and derivatives market . Over the coming years, the rivalry between these players is likely to increase substantially due to their rising involvement in mergers, acquisitions, and partnerships. According to the research report, the overall consumption of syngas and derivatives which were 115,000 MWth in 2015, is likely to swell at a healthy CAGR of 9.40% during the period from 2016 and 2024 and reach 256,605 MWth consumption volume by the end of the forecast period. Biomass gasification is the most applied technology for manufacturing of syngas and derivatives across the world and is likely to remain so over the next few years. In this research report, the worldwide market for syngas and derivatives has also been analyzed on the basis of geography. As per the study, Asia Pacific, the Middle East and Africa, North America, Europe, and Latin America are considered as the main geographical segments of this market. In 2015, Asia Pacific led the global market with a share of more than 52%. The regional market is anticipated to retain its dominance over the forecast period, thanks to the availability of coal and natural gas reserves in abundance. The rise in urbanization, infrastructural developments, and the continual discoveries in the field of oil and gas are also projected to support the Asia Pacific market for syngas and derivatives over the forthcoming years. The market for syngas and derivatives in the Middle East and Africa, which stood second in 2015, is anticipated to maintain its position in the near future, owing to the augmenting usage of syngas for the generation of power electricity. On the flip side, the markets in North America, Latin America, and Europe are predicted to witness a sluggish rise over the years to come, notes the market study. The increasing concerns over the finite number of fossil fuel resources, coupled with the rising level of pollution caused by them in the atmosphere, has fueled the need to reduce the dependency on them. 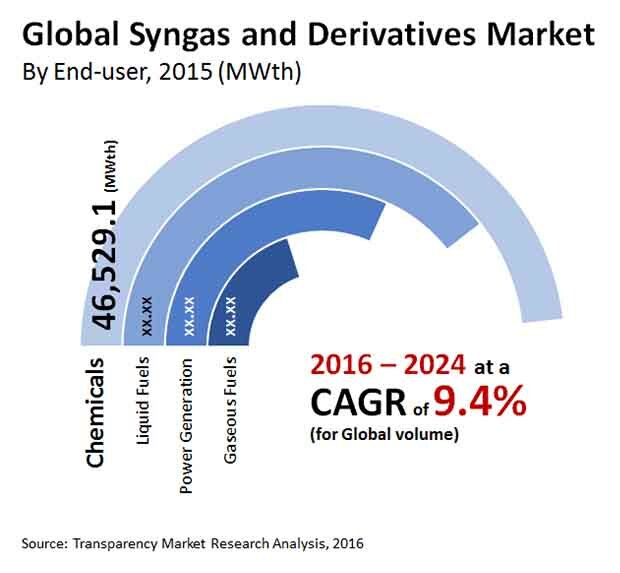 “With syngas emerging as a promising alternative to fossil fuel, its demand has swelled substantially, resulting in a significant rise in the global market for syngas and derivatives,” says a TMR analyst. Apart from this, the rising usage of derivatives in a number of industrial applications is also reflecting positively on this market. Going forward, the growing demand for fuel, electricity, and agricultural products is expected to boost this market considerably in the near future. However, insufficient capital investment and funding may hamper the growth of this market over the next few years, reports the study.